commissioned top modern makers to put levers or melodeon style buttons on their instruments. Ooh! what a good idea, and with a clear approach to making the modification demountable! try that on a slightly more modest instrument - thank you for the suggestion (oh! what a give-away!). The old choice, new but not traditional, or traditional but old! I really am a big believer in try before you buy. I've bought several concertinas over the years and have not always chosen the one that was best "on paper". I always choose the one that feels right in my hands and sounds right to my ears. For example, sometimes a rattly action is irritating, sometimes it's character! I had a Marcus "deluxe" 30 b in GD and it was a fine box until I had a better one to compare it to. Had I not had that bit of luck and got an upgrade at a very fair price, I might still be happily playing the Marcus. You can't go wrong with a Marcus. I know one professional performer who has several. You can have a lot of fun on a 20b, but it does put certain tunes, chords and keys off limits. If you're only going to have one good box, it's worth going for 30b, or possibly even more. I have always made it my business to try any Anglo that comes within reach. I have found some makes that I consistently dislike, and some that I consistently like, yet far better players than I will ever be have reached the opposite opinions. It's a combination of what you expect, and what is important to you. For example, I have never disliked any of the many Normans that I've played. Analyse one and it's nothing special, but they just suit me. I have played a few Connors. The owner of those Connors could make them sing, but I could barely get a tune out of them, finding them turgid and unpleasant to play — and he didn't particularly like my Dipper, which is my pride and joy. The longer you spend looking, the better the chance that you'll find a bargain. I would always prefer vintage over hybrid if the vintage is in good condition, but I'd rather have a nice modern hybrid I can play than a leaky vintage that needs work doing on it. 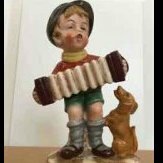 When I purchased a second-hand instrument from the U.S., there was import duty of 3.8%, and then VAT at 20% on the price including the import duty! To clarify, the people I know who commissioned different types of air buttons specified them on new instruments, not as modifications to existing ones. 1) The old choice, new but not traditional, or traditional but old! 2) I had a Marcus "deluxe" 30 b in GD and it was a fine box until I had a better one to compare it to. Had I not had that bit of luck and got an upgrade at a very fair price, I might still be happily playing the Marcus. 3) You can have a lot of fun on a 20b, but it does put certain tunes, chords and keys off limits. If you're only going to have one good box, it's worth going for 30b, or possibly even more. so bloody loud - great! That extra information and the detailed picture is extremely helpful - thank you very much! I'd always recommend more than 20 buttons (ideally a full 30) if you only have one box. However, I absolutely agree that playing a 20 is delightful and is also great for your understanding of the music. I've become a better player since I acquired my first 20. It has diverted me from the lazy easy options and made me think abut more interesting ways of using the left hand. It has also encouraged me to play more in the higher of the 2 main keys. I now have a 30b GD Dipper, a 30b Lachenal baritone, a 20b Lachenal standard size and a 20b Lachenal piccolo. I often treat the 20s as palate cleansers before returning to the comparative luxury of the 30s. Glad you're getting on with the Marcus. I looked at it US import info and it looks like duty doesn't become an issue until $2500+ However, one of the barleycorn concertinas I looked at had rosewood which is a cites issue that turns 100 bucks shipping into 200 real quick. Being that mine is a "cheap, nasty box" as well, I elected to try and modify it this weekend. However, my "lever" kept splitting when I tried to mount it, so instead I opened the concertina, removed the grip and moved it about 1/4" closer to the buttons, the grip about half hides the old holes. This seems to be just enough to make the difference for me. And since it's plywood and veneer, no foul against something of beauty. Keep your Bonetti. Learn tunes and technique. Wait until the next NE Sqeeze-In and take a short vacation. You will be able to see, hear and if you are polite, play near every thing: all the hybrids, many new concertina builders, lots of restored, etc. etc. Plus, the Button Box will likely have nearly all of their stuff there as well. IMO best way to figure out next move. Second opinion: can't go wrong buying one of the better hybrids new or used: they have good resale value and will be more fun to play than your current box. Insight email address no longer viable. Use: gjowaisas(type "at" symbol)fioptics.com Or pm me through concertina.net's personal messenger. Thank you for the reference, Mike. I try my best to help folks with their concertina adventures. I usaully recommend/encourage scheduling a visit for anyone in the Midwest or for anyone who feels a trip is worth it in order to try out a number of concertinas in person. I'm 15 minutes from the CVG (Cincinnati/N. KY airport) and can pick you up. Cincinnati, OH can be a a very lovely city to visit in conjunction with a concertina expedition. You have a lot of choices right here in North America. That 21 button Marcus (you've probably already figured this out) is going to translate to around $1900.00. Just for the instrument. In N.America you have Greg Jowaisas(he'll have a lot to choose from in various price ranges), The Button Box in Massachusetts, and Frank Edgley in Ontario(his new instruments may be out of your price range, but he doesn't have any prices posted today, so it is hard to say!). Used ones turn up here and there, ebay, this site, look around....there are three Stagi W15-LNs at the Button Box for $750.00, they would be quite a step up from what you are currently playing, and should be about the same size as a Lachenal Anglo. But check with Greg Jowaisas, he is on this site, or, if you want, send me a PM and I will give you his phone number. He is just across the Ohio river from Cincinnati. Good luck in your search! Of course of only 2 commitments I know of that late in the year, one of them falls on the weekend of 9/22 but that looks like a really neat event! Chris at Barleycorn said he would look out for a 30 C/G anglo for me as the rosewood Jones was going to be a problem in international shipping. , I attach images of a Lachenal 30 key that came in today. It is completely rebuilt with new ends-not rosewood-new metal buttons , new bellows-and they are 6 fold. It has been rebuilt by a guy called Bill Crossland and it has new pads, valves, straps and is tuned to concert pitch. 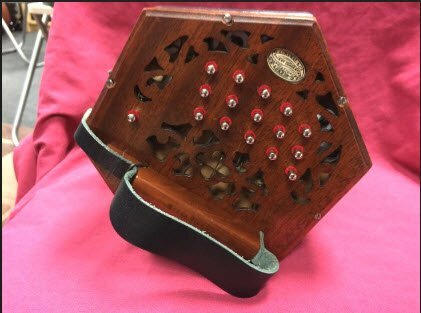 It plays decently-nowhere near as good as a rosewood at [higher price] but it is only [about at my price range] which is as cheap as you can ever get a 30 key genuine concertina with steel reeds and 6 fold bellows. It is a genuine instrument with a proper sound and is way better than the cheap budget things. Just reading discussions on this forum, it would seem Lachenal are regarded as middling? Would that be accurate? Seems like a very nice instrument. For the kind of music you are interested in this would probably do the trick. From my experience, the cheaper Lachenals are all over the map in terms of playability. I think some were simply built better than others, but their treatment over the years probably accounts for most of the variability. I wouldn't buy one that I couldn't try first, however Chris is a reputable, straight dealer -he describes his wares fairly and doesn't sell junk. Having said that, if I were in your shoes I'd be keeping my eyes out in the USA for a used Morse or Edgley (or Tedrow, but they don't seem to come up often) while I saved up another 2 or 300 clams. You won't find an easier playing, more responsive vintage instrument in that price range, and you won't have to deal with 100 years of wear and tear and unknown maintenance. The sound of accordion reeds vs. concertina reeds is a matter of personal taste- the quality hybrids sound great, just different. I have both, and enjoy playing them all. The Morse has the added advantage of being as light as a feather. They also hold their value well, so if you are ready to move on in a few years time, you can generally sell a used hybrid for about what you paid for it.